The numbers are in and the ratings for this year's Super Bowl are the lowest they've been in ten years. This year saw Tom Brady and the New England Patriots heading to the biggest game of the season for a third consecutive year to take on the Los Angeles Rams and the young Jared Goff. 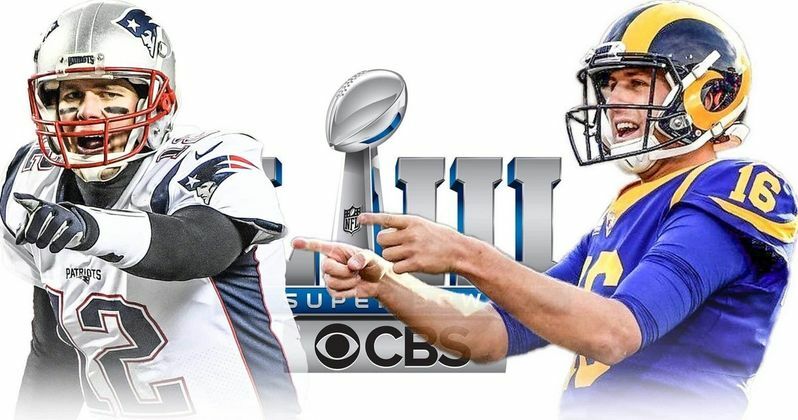 Ultimately, the Pats bested the Rams in what has widely been regarded as a snoozer, which may very well help explain why the ratings for Super Bowl 53 aren't what they perhaps could have been/should have been. According to Nielsen, the overnight household rating was 44.9, which means just shy of 45 percent of households in America tuned into the game. That represents a 5 percent decline from the previous year, which saw the Philadelphia Eagles defeat the Patriots in a decidedly more exciting contest. Last year's number for Super Bowl 52 was 47.4, which equated to roughly 103.4 million viewers in total. While the final numbers haven't been revealed as of this writing, it's expected that this year's game will result in just shy of 100 million viewers. A range of factors will have to share the blame here. The final score was 13-3, making it the lowest scoring Super Bowl in history. Not exactly what NFL fans tune in for. The previous record holder was Super Bowl VII, which saw the Miami Dolphins beat the Washington Redskins 14-7. There are also those out there who are very bored with the proven greatness that is Tom Brady. The narrative is a tired one for those who aren't actual fans of the Patriots. Brady had, even before this record sixth Super Bowl win and ninth appearance in the big game overall, cemented his place as the greatest quarterback to ever play the sport. Yet, he got that sixth ring anyway. Related: Walking Dead Season 9 Midseason Premiere Is Streaming Right Now! Then there's the matter of the halftime show, which saw Maroon 5 as the headliner, with Travis Scott and Big Boi on board as support. The performance has been roasted thoroughly on social media and, given that the score was 3-0 heading into the half, the lackluster show didn't help matters any. Even the much-hyped appearance by Spongebob Squarepants was quite brief and anticlimactic. Performers such as Cardi B reportedly turned down millions to perform in solidarity with Colin Kaepernick, who has been ousted from the NFL ever since his famous protests during the national anthem. This is the worst performance, ratings wise, since the Steelers beat the Cardinals a decade ago in 2009. Advertisers also likely aren't happy to hear this, as CBS was charging roughly $5 million for a 30-second ad spot during the game. The Super Bowl commands such dramatically high ad dollars due to the promise of a very large, captive audience. While 100 million viewers is nothing to scoff at by any stretch, that's a lot of money that Burger King shelled out to air that bizarre Andy Warhol commercial. This was previously reported by Deadline. Walking Dead Season 9 Midseason Premiere Is Streaming Right Now!